한상숙, 김오숙, 주윤수, 최은덕, 한정원,(2013).간호사의 멘토링이 이직의도에 미치는 영향.대한간호과학회지,43(5),605-612. Purpose: The purpose of this study was to investigate the casual relationship between nurses" mentoring and turnover intention and to verify the goodness of fit between a hypothetical model and actual data in order to suggest an adequate model. 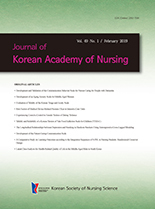 Methods: The survey was conducted with 434 nurses working in general hospitals in Seoul. Data were collected during February 2013, and analyzed with SPSS Windows 18.0 and AMOS 7.0. Results: Mentoring was found to have a direct effect on decrease in role stress. Role stress had a direct effect on increase in burnout and mentoring, with role stress as a mediator, there was an indirect effect on burnout. Burnout had a direct effect on increase in turnover intention, and role stress, with burnout as a mediator, and mentoring, through role stress and burnout, an indirect effect was found on increase in turnover intention. Conclusion: The results of this study indicate that nursing managers should put effort into reducing role stress and burnout, while seeking to establish a more efficient mentoring system so that for nurses, there will be a lowering of turnover intention.